Idea #1: Candy object lesson (inspired by this idea) Gather at the table and place a bowl of candy or some kind of treat in the center. Casually say something along the lines of after our lesson we'll have a treat but please don't take any until we are done. Show the video clip or tell the story in your own words of Jesus being tempted. At some point during the lesson start to reach for the treat but say "oops I'm suppose to wait." After the story talk about some ways we are tempted and how Jesus was able to resist temptation. During this time again reach for the treat but stop yourself. Finally bring the attention to the treat. Ask how many of you wanted some of this candy (or whatever you are using)? Talk about how much you really wanted some and it was hard to resist the temptation to eat some before we were done. Here's the big one explain that we are all tempted, even Jesus was tempted but we can follow his example and resist temptations. (more on this topic in the I & F manual). Idea #2: I can be Strong like Jesus! -"Why was Christ prepared to resist temptations? He fasted, He went to be with God, and He knew the scriptures." (primary manual) As we follow Jesus's example we can be strong like him and resist temptation. Hide the dumbbells around the room. 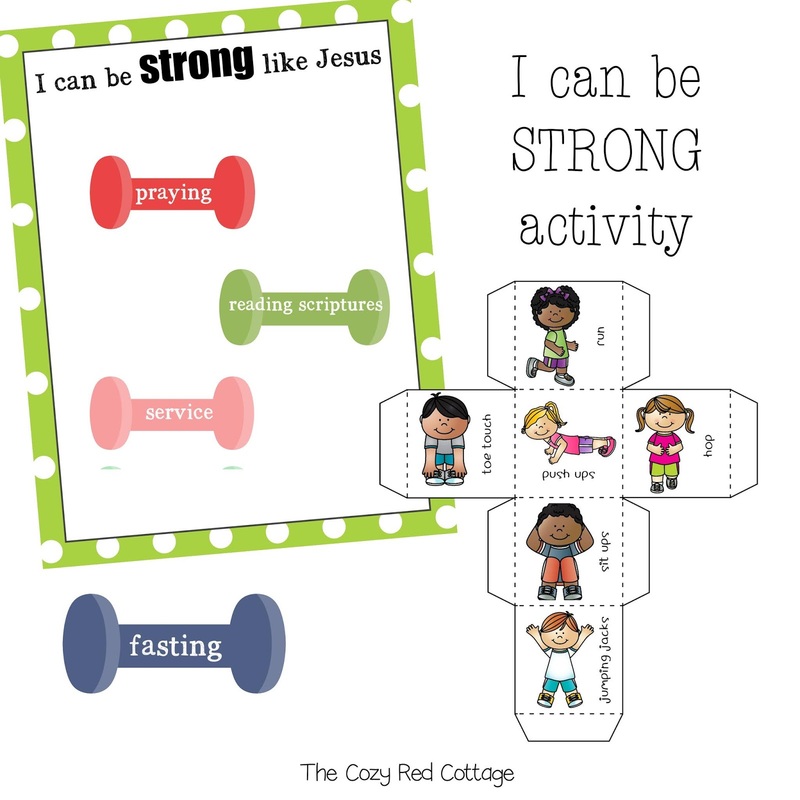 Take turns finding one and read something we can do to become strong like Jesus. Tape or glue to the "I can be strong like Jesus" board. I like to display these throughout the week. If you have real dumbbells it would be fun to have your kids lift one every time one is found. 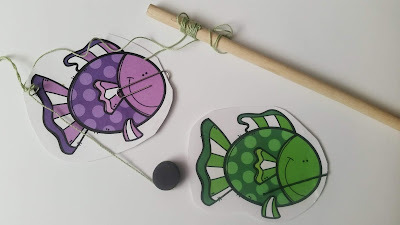 You can also use the exercise dice from this lesson (I've included in this download for convenience) or I love the idea from Little LDS Ideas with the large shirt and balloons. You can adapt it to this lesson by have one of your kids wear a really big shirt and after each dumbbell is found stuff a balloon into the shirt to create muscles. Luke 4:18-19: Jesus came to teach, comfort, & heal (P) Share some of the miracles Jesus performed in these chapters and Matthew 4:11 (JST) of John in prison. We are going to talk about how much Jesus loved everyone and spent his time serving and healing those in need. discuss someways we can show love to others. 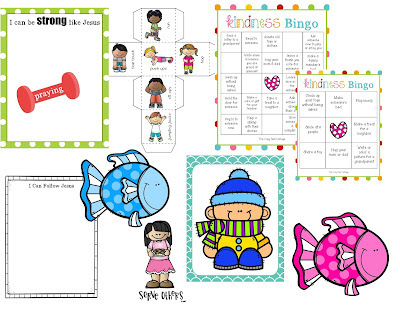 During the week we are going to play service bingo. The idea is to serve others as Jesus did this week. 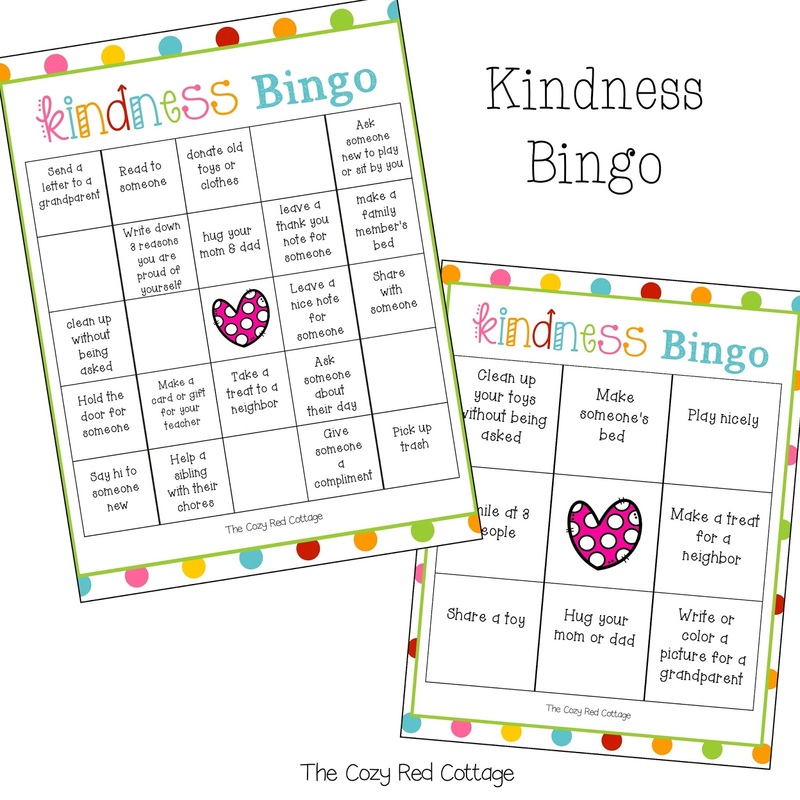 As you complete a square mark it off-maybe have a little prize or special treat for those that get Bingo or even better a blackout! I've included 3 different boards. The first is for the little ones -you just need 3 to get a Bingo. I've filled one in and the other is left blank so you can customize it. The third is for older kids. I created this for Activity days (I'll be sharing our activity soon!). Its a traditional size with a few blank spots they can fill in. I love the example of these men. In the video it shows they answered the Saviors call immediately. In the scriptures it uses words like straightway, immediately, and they forsook all. (Matthew 18-22, and Luke 5:11) This would be a great to discuss what they walked away from and that following the Savior is not always easy or convenient but worth it. How can we follow Jesus fishing game: I love using fishing games in any lesson. Its easy to put together and kids love it. Assemble your game (see below) and place the fish on the ground. Take turns catching a fish. 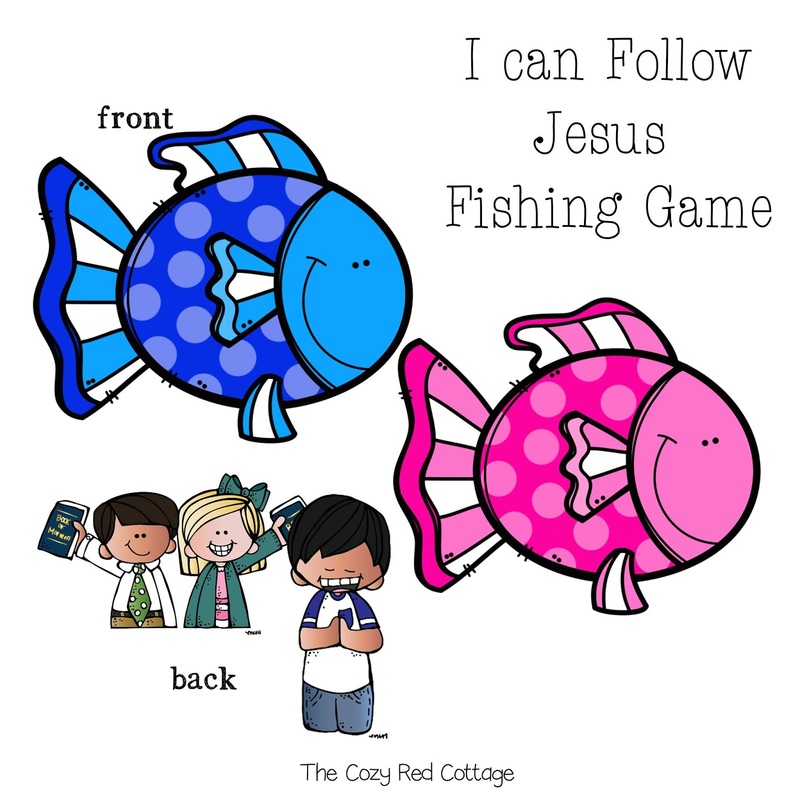 Flip the fish over and discover a way we can follow Jesus. 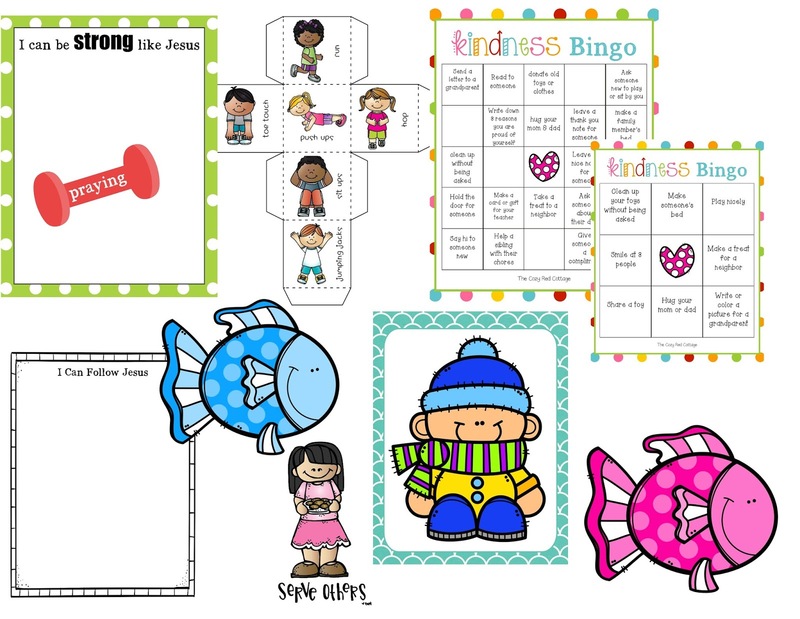 You can print extra fish and fill in with your own ideas or give one to each child to draw a way they can follow Jesus. This also would go really well with the coloring page in the primary manual. Prep: Here's a little printing tip...print the fish on cardstock (laminate if its an option). Then I tape the questions, pictures, etc. to the back that way you can easily reuse the fish for another lesson. For this game cut around the pictures and they will fit on the back of your fish. Also print in draft mode whenever you can to save ink! Add paperclips (bobby pins also work) to your fish. To make the pole I use a wooden dowel but any sort of stick will work. Cut a long piece of yarn. Wrap some yarn around top and hot glue or tie to your pole. At the end of your string hot glue two button magnets together. You can skip the glue but for safety I would glue them if you have little ones in your house. 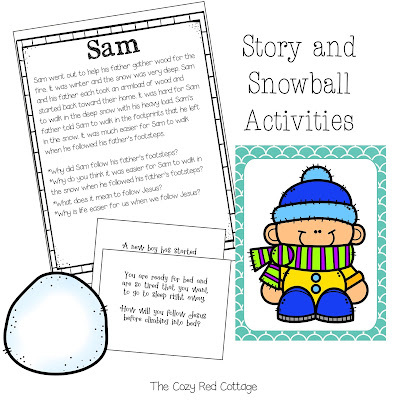 Sam Story and Snowball toss Review Game: I found this cute story about Sam in last years primary manual. Share the story using picture cards. The following pages have a scenario and question. Print on regular paper and crumple them up to make a snowball. Set a bowl on one side of the room and take turns trying to toss the snowball into the bowl. When you get one in the bowl open the paper and read the scenario and answer the question. 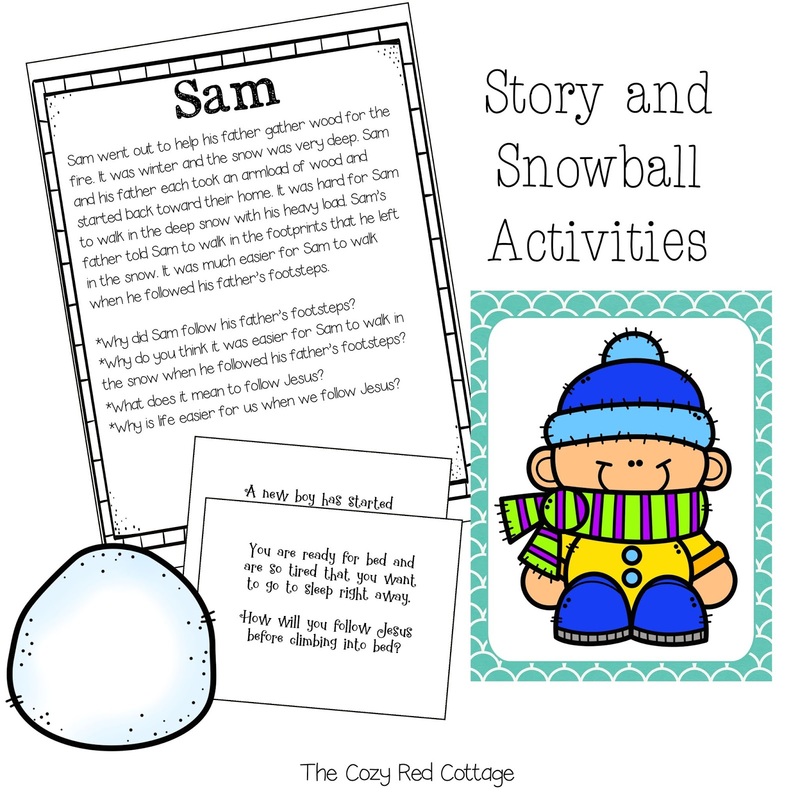 For little ones you could also make a snow sensory bin (found here). Instead of letters hide the snowballs or cut and hide some hearts. When they find one have them name a way they can follow Jesus or someone they love. Coloring/drawing page: I thought it would be cute to trace the kids feet and draw or write how they can follow Jesus. 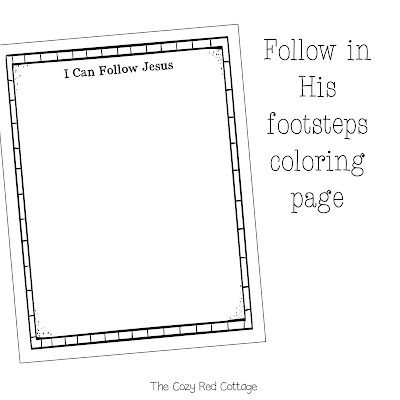 The coloring page from this lesson would be cute too. 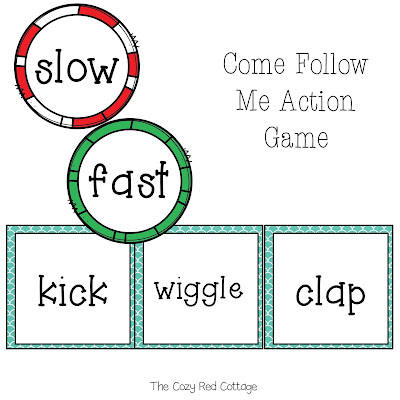 Come Follow Me (follow the leader) cards: I shared this with another lesson but thought it would work really well this week. 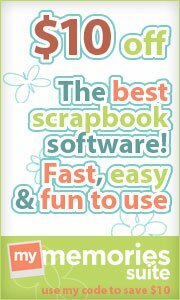 Print and cut out cards and slow and fast cards. One person is a leader and draws an action card. Sing do as I'm doing, follow the leader, or just have fun moving. The leader can pick just one speed circle or have fun switching up through out the song. 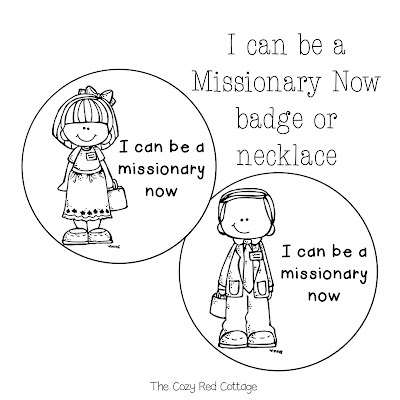 If you want to talk about being "fishers of men" you can find these cute missionary necklace/badges in this lesson. I just love your ideas! Thank you! I would love getting your emails as well. Crystal! My sister just shared your site with me. 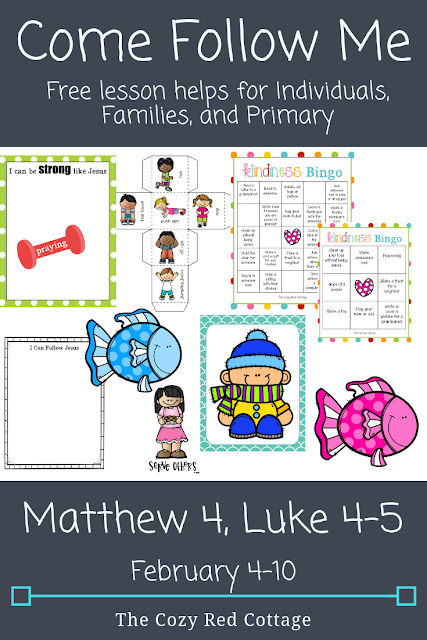 I’ve been struggling with making each week’s lesson more kid-friendly. I’m too tired to be that creative! So thank you for putting these together! I look forward to using your ideas each week! I'm so happy you found us and that some of these ideas work for you family :) Thank you for leaving such a sweet comment it made me so happy! I would love to be on an email list. I left some instructions on your other comment :) Please let me know if you have any questions. I am so grateful for your ideas and the effort you put into this! It has made my life so much easier, and my kids and primary class love doing all the activities ❤ My husband even included gratitude for you in our prayers this week 😊. You are awesome - thank you! Thank you so much for providing your work to the public...for free!! Thank you! Every week I come and secretly hope you haven’t stopped. This has been a game changer for my family. I love your insights and I really love your games/printables. I gave the baptism jeopardy board to our primary to use at their upcoming Great To Be 8 Night. I often share what I’ve printed off after I’ve used it. Will you tell me the benefits of being on your email list? I just keep a tab open on my safari app for your page. Hi Sarah, thank you so much for leaving this sweet comment. I love that you are able to use some of these activities with your family and thank you so much for sharing with others :) The benefit of the newsletter is really just having the direct link being emailed to you each week. If you already keep a tab open or like to check back each week I don't know if there is much. I occasionally share some exclusive printables (often holiday ones) to my email subscribers. I'm still trying to figure out what I'm going to do with the newsletter so if there are some additional benefits or incentives then I'll let everyone know in one of the Come Follow Me posts. Thanks again! Thank you so much! This is fabulous. I'm so glad I found your site. Thank you! I'm new at teaching the 5 year olds and I love the inspiration and ideas you've shared. And thank you for sharing your talents at no cost...they're so very helpful! Thank you so much for all the time & effort you put into preparing these lessons. 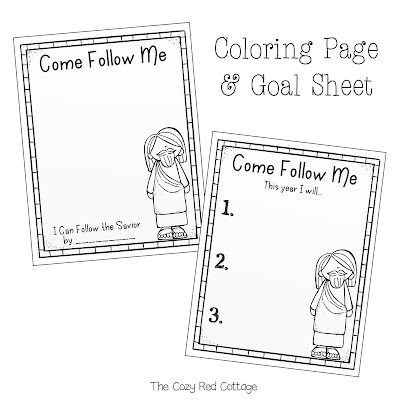 It has helped in our preparations as a family to study the Come Follow Me manual & make it meaningful for our kiddos. Your lessons are so helpful with such great ideas. Thank you again! Great ideas!! Can I sign up for your email list?! Thanks so much for sharing your talents!